OK, so the final lamp is really only two feet tall, but it's modeled after a modern architectural wonder—the skyscraper. Actually, It's Amazing! 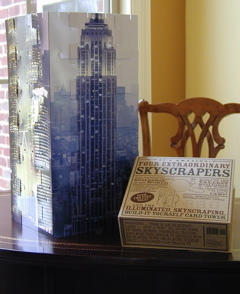 Four Extraordinary Skyscrapers by Edwin Kiester is a great little bargain book from Barnes & Noble that doubles as a DIY lamp kit.